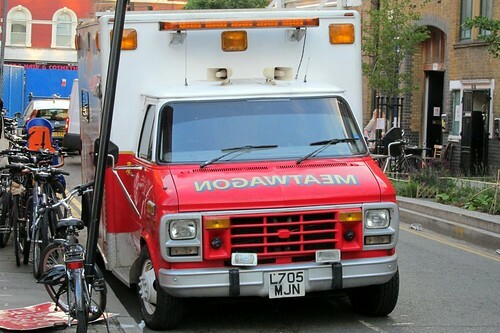 Jumping back a little in time now, I finally bring to you my first experience at that elusive, wondrous, carnivore’s heaven in a van that is The Meatwagon! 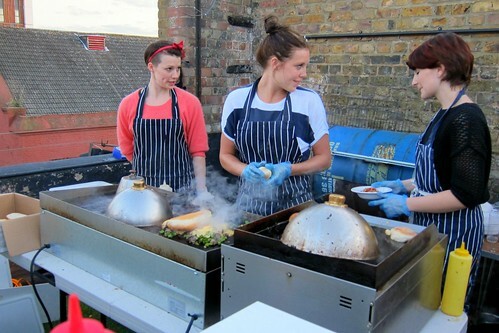 On this occasion they were doing a one off pop up at the Dalston Roof Park. 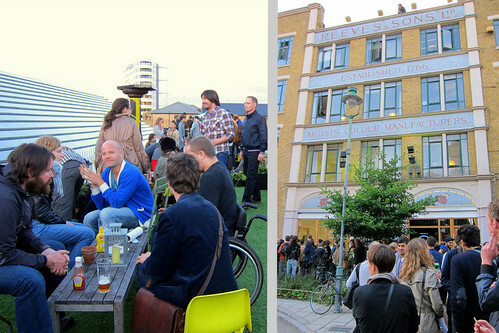 It was a Friday night in May; the place was absolutely buzzing, and that was just the hungry queue forming to get in. We had some American guests in town and so I was interested to see what they thought of London’s rising star in the burger world. 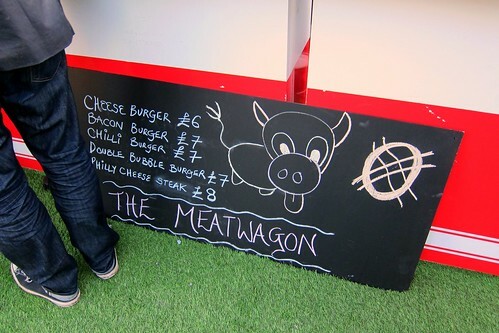 Meatwagon proprieter, Yianni Papoutsis was kind enough to chat to us and offer us a variety of burgers to sample. The Meatwagon burger was quite a different beast to that of the Shake Shack variety I’d consumed and adored previously in New York. Rather than being soft, small and cute, this was what I’d think of as a real masculine burger; a large, meaty, rustic, hulking beast of a thing! Like a strongman to a baby. Very different, but both great in their own way. 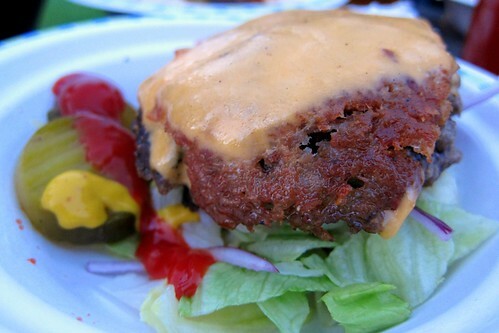 The texture was grainier but there was excellent fat content keeping the meat juicy and tasty. 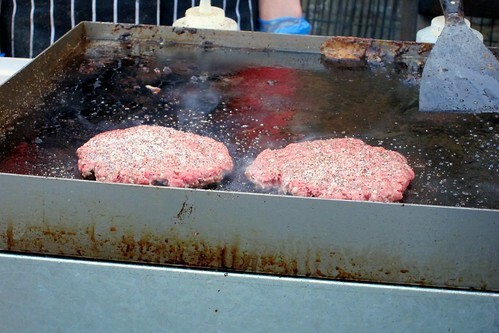 We sampled one bacon burger and one chilli burger. Both were excellent but the bacon burger was definitely my favourite with it’s salty, cured meat goodness. I found the use of American cheese interesting. Until recently I’d always been suspicious of American Cheese, thinking it unnatural and plasticky. 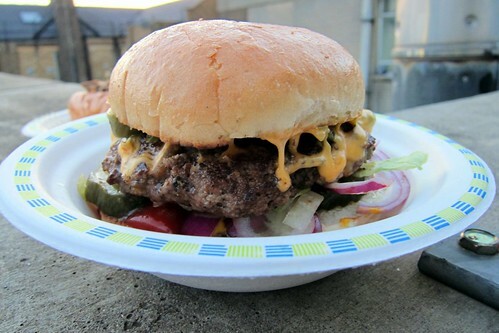 Since sampling both Shack Shake and Meatwagon burgers I’ve become quite fond of it and am realising it’s appeal, including the fact highlighted in a Serious Eats – A Hamburger Today article… nothing melts quite like it! 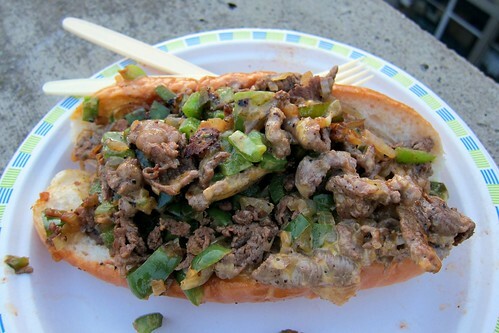 I regret not sampling a Philly cheese steak in the States. The Meatwagon’s version was the very first I’d ever eaten and it was fantastic, with thinly sliced steak, onions, green peppers, and gooey, gooey American cheese. 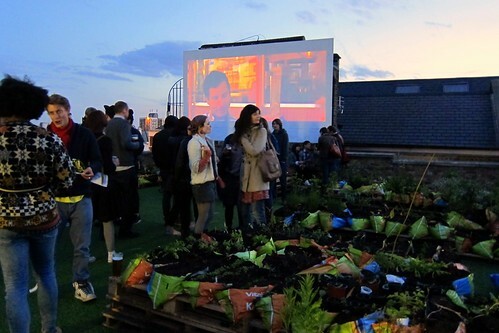 The pop up was hugely popular and coincided with a vintage clothing sale, and film screening. 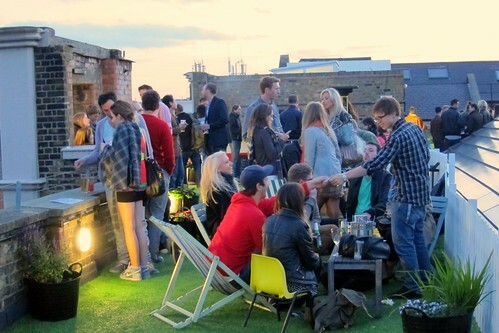 But it was clear what everyone had come for, and burgers very soon sold out. Fortunately they still had most of the key ingredients and were able to produce an Atkins friendly version. 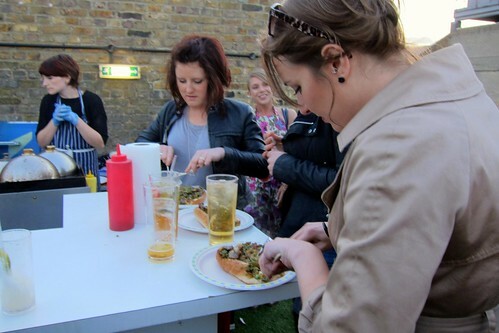 I’m pleased to say that our American guests were most impressed and really enjoyed the pop up. 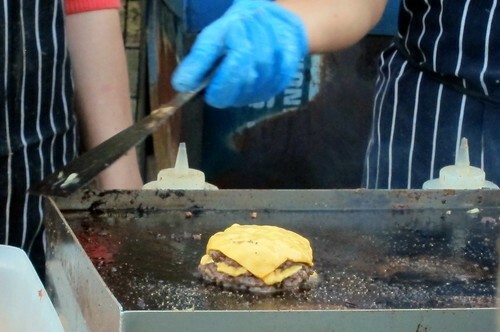 It’s nice to know that we have burgers available to us in London that rival those of the burger motherland. 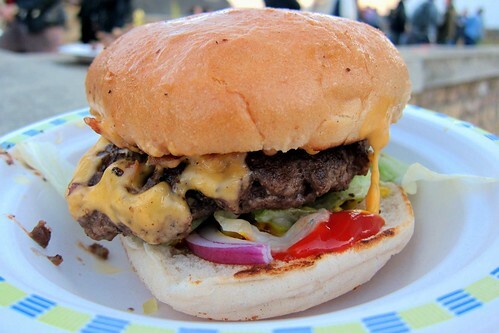 The Shack Burger – best burger ever! 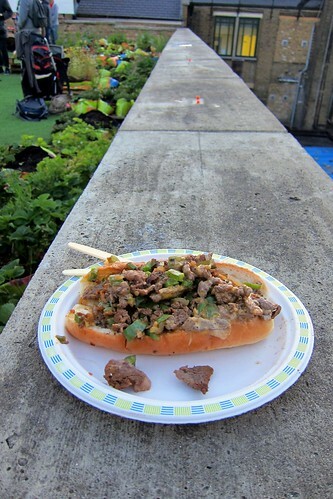 Eight quid for the Philly cheesesteak? Yikes.